Bill Clinton is correct that Comey “amended” his statement in the hearing, to provide more details about what the FBI had found. But Comey did not say Hillary Clinton “had never received any emails marked classified.” Two of three emails that had portion markings were call sheets that were improperly marked, and State Department considers the markings no longer necessary or appropriate at the time they were sent. Comey acknowledged that Clinton may not have known what the little-C marking meant. Moreover, the diversion to “little-C” markings is an effort to distract the public from the disturbing finding by the FBI that Clinton was “extremely careless” in handling her emails, and should have protected the information whether or not it had a classification marking. And it distracts voters from the fact that for more than a year, Clinton modified her excuse over and over to position herself in a way she can declare she was technically right in some form or another. 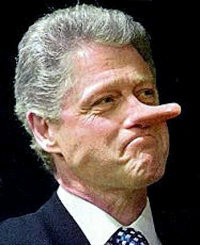 Bill Clinton also repeated the Democratic excuse that she used a personal email account just like her predecessor, and that she turned over more email records than her predecessors did. This comparison is a pathetic and misleading attempt to normalize Hillary Clinton’s use of her personal email account and play down the fact that she was the only secretary of state to use a private server. The decision to use a private server is the root of all of the political difficulties concerning her email practices. No matter how many times the Clintons and their supporters tell the same lies, the facts are clear. Hillary Clinton knowingly and intentionally violated State Department rules in effect as of 2009–which were made stricter in response to abuses during the Bush administration. She is the only one to have used a private server to circumvent the law. Hillary Clinton actively tried to cover up her actions, failed to cooperate with investigators, and has repeatedly lied about the manner. While I doubt she intentionally sought to compromise national security, she did send and receive classified email, including instructing an aide to remove the “identifying heading” on one document. Multiple other lies have been identified by media fact checkers and in the reports from the State Department Inspector General and FBI. In a statement last month, FBI director James Comey said the FBI “did not find clear evidence that Secretary Clinton or her colleagues intended to violate laws,” but that the use of a private email server was “extremely careless.” Comey advised the Justice Department that “no charges are appropriate in this case,” and career prosecutors agreed. Of course we know that there is a double standard in the United States, and that Hillary Clinton is too big to jail.